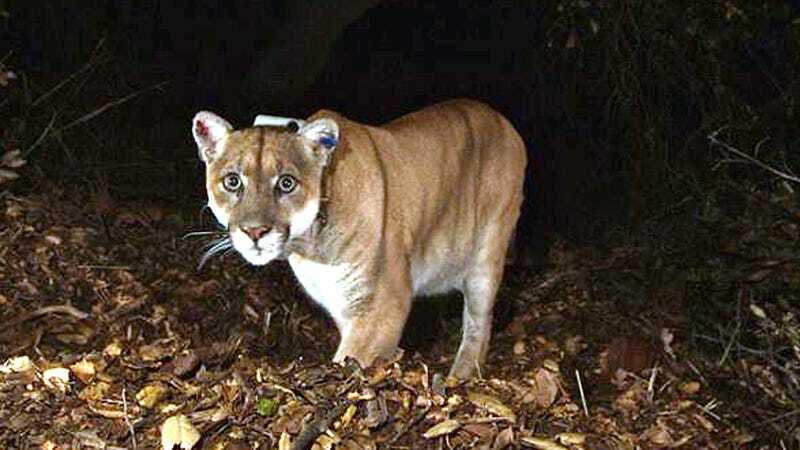 A November 2014 file photo of P-22, a wild mountain lion that lived alongside millions of people in Griffith Park in Los Angeles, and was considered a suspect in the death of a koala at the LA Zoo that year. According to the Coloradoan, Colorado Parks and Wildlife (CPW) has confirmed that a male cougar (Puma concolor couguar, also known as a mountain lion, puma, or catamount) weighing at least 80 pounds attacked the man and managed to inflict bite wounds to his face and wrist—before the tables turned and the man managed to suffocate it with his bare hands. The runner sustained “serious, but non-life threatening injuries” in the deeply unfortunate incident, CPW wrote in a statement, while wildlife officials took the corpse of the cougar for a necropsy. Colorado wildlife officials emphasized to the Times that mountain lions have only caused three confirmed deaths in the state since 1990, and under 12 in North America in over 100 years. However, the CPW website advises that interactions between the animals and humans have been increasing in recent years, with factors including encroachment on cougar territory, a measured increase in deer populations and a “presumed increase” in cougar populations, and people simply being more aware of their presence. If the cougar approaches, the website advises people to talk “calmly and firmly” to it while backing away slowly, as well as to avoid running and attempt to appear larger (such as by raising arms or expanding a jacket) if possible. If it appears to be behaving aggressively, CPW further advises people to try and dissuade it by throwing objects “without crouching down or turning your back” and to fight back with any available weapons, tools, or other objects in the event of an attack.